It would have been incomprehensible, at the turn of the nineteenth century, to believe that the actions of one man could set in motion a series of events that would reverberate through history for the next nine decades. Yet when Gavrilo Princip stepped in front of the automobile carrying Archduke Franz Ferdinand and his wife, the Duchess Sophie, putting two bullets into their bodies and killing both, that is precisely the path on which he sent the world. The son of a postal worker, Princip was born in Obljaj (Oblej), Bosnia. His father, Petar, was married late in life to a local woman, Maria, also known as Nana, who was fourteen years younger than her husband. Petar and Nana had a total of nine children, four daughters and five sons. Only three children survived infancy. Princip was the fourth child and second son, born seven years after his brother, Jovo. When Princip was born his mother wanted to name him for her brother, Spiro, but the local priest insisted that since he was born on the feast day of Saint Gabriel, he should be called Gavrilo. Neither parent disagreed. 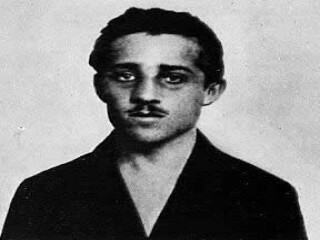 Princip's birth date is recorded as July 13, 1894. When he was baptized a month later a young priest recorded the birth date in the parish register as July 13, 1894, but he recorded the date in the civil register as June 13, 1894. This conflict would play a pivotal role at his sentencing nineteen years later. school and convinced Princip to enter the merchant school. The first three years at the school were uneventful. Princip was a good student, reserved in manner and a voracious reader. By the end of his third year he decided to transfer to a classical high school. Although not in favor of the change, his brother Jovo reluctantly agreed. In August 1910 Princip went to Tuzla and enrolled in the fourth grade of the high school. He graduated in 1911. But it was events prior to this that set the stage that would ultimately direct world politics for the rest of the century. On October 5, 1908, the Austro-Hungarian Empire annexed Bosnia. Public opinion in Serbia immediately soured. The Serbian nationalists believed that this action unfairly snatched the Bosnian territory from their grasp. Two secret societies instantly surfaced: Narodna Odbrana (National Defense) and Ujedinjenje ili Smrt (Unification or Death), also known as Crna Ruka (The Black Hand). The year 1911 was critical for Princip. His ideals began to change, and he became more deeply involved in the Greater Serbian cause. He continued school in Sarajevo and Tuzla, and in 1912, at the age of eighteen, he traveled to Belgrade where he took a more Serb-national education. At the same time a group of students formed Mlada Bosna (Young Bosnia) and adopted an anti-Hapsburg stand. Their campaign took on a wider, Pro-Yugoslav slant, moving away from their previous narrow Serb nationalist position. Of this group, Princip went on to become the most famous, moving into the ranks of the Black Hand. He clearly defined his beliefs when he stated at his later trial, "I am a Yugoslav nationalist, aiming for the unification of all Yugoslavs, and I do not care what form of state, but it must be free from Austria." The Ujedinjenje ili Smrt (Union or Death) was a secret society also known as the Black Hand. The society was formed in 1911, one year before Princip was recruited and trained in terrorism. It was during this training that his desire to unite the south Slavs into a federal nation by eliminating the Austro-Hungarian rule began to surface. It became clear to Princip that this goal would only be achieved through the elimination of a government official or a member of the ruling Hapsburg Imperial family. Princip had a history of ill health and although admitted to the Black Hand academy in 1912, he was considered unfit for active duty. His health did not, however, prevent him from coming to the attention of the organization's leader, Major Tankosic, who considered him to be a strong personality with good leadership qualities. By the spring of 1913 relations between Austro-Hungary and Serbia were critical. War was imminent between the two powers. Serbian conquests of neighboring territories threatened the Austro-Hungarians, causing the military governor of Bosnia to declare a state of emergency. His actions were harsh and immediate. He dissolved parliament, suspended civil courts, closed Serb associations and took over the control of Bosnian schools. By the end of May 1913, the short-lived First Balkan War ended with the Treaty of London. However, by this time the governor's anti-Serb policies were securely established, much to the distress of the Serbian citizens. Everything was now in place for the events that would occur in June of 1914. The Austro-Hungarian army made plans to stage military maneuvers in Sarajevo, and Archduke Ferdinand and his wife were scheduled to be present to review the army. Princip remained closely tied to the Black Hand society during this two-year period. When it was learned that Archduke Franz Ferdinand would make an official visit to Sarajevo, the wheels were set in motion for one of the most disruptive acts in world history. As a plot to assassinate the Archduke began to unfold, Princip was selected to be its leader for his marksmanship abilities and those very same leadership qualities recognized two years earlier. On June 28, 1914, Princip and his comrade, Nedeljko Cabrinovic, along with four other members of the Black Hand, awaited the arrival of the Archduke. The first attempt to assassinate Ferdinand failed when Cabrinovic tossed a bomb at the royal automobile, but the bomb bounced off it and rolled under a second car, exploding and injuring an army officer. Archduke Ferdinand and his wife Sophie, the Duchess of Hohenberg, sped off to a reception at the City Hall untouched. Afterward the Archduke asked to visit the officer who had been injured earlier that day, and his driver unwittingly followed the same return route as the one taken earlier. The Duchess was not originally scheduled to return with the Archduke, but when last minute plans were made to visit the officer injured in the first attempt, she insisted on accompanying her husband. This decision, coupled with the lack of judgment in planning the return route, resulted in her death. The return route brought the Archduke back into the sights of Gavrilo Princip. As the royal car stopped within feet of him, Princip stepped forward and fired two shots. Sophie was hit on the right side and died first. The Archduke outlived her by only a short time. The bullet that took his life severed his jugular vein and came to rest in his spine. Princip later claimed that he intended one shot for General Oskar Potiorek, military governor of Bosnia, but the shot felled the duchess instead. One month later, on July 28, 1914, Austria-Hungary had found the reason it sought to enter into war. It held Serbia accountable for the actions of Gavrilo Princip and declared war. Princip understood only too well the actions that would follow. He attempted suicide at the scene by shooting himself, but a quick-thinking onlooker swiftly knocked the gun from his hand. A mob began to close in, but Princip was rescued by the police and imprisoned. Princip and his fellow conspirators were all arrested at the scene, but during questionable interrogations, neither Princip nor Cabrinovic broke their code of silence with the Black Hand. His account of the event was not clear. "Where I aimed I do not know. But I know that I aimed at the Heir Apparent. I believe I fired twice, perhaps more, because I was so excited. Whether I hit the victims or not, I cannot tell, because instantly people started to hit me." One of the group, Danilo Ilic, confessed to his participation and nearly spelled disaster for the group, but Princip was able to gain control and exercise his leadership over the group. While in custody, Princip again attempted suicide by the use of cyanide, but again his attempt was unsuccessful. Throughout the trial Princip remained quiet and aloof. He also remained loyal to the Black Hand, refusing to place the blame for the assassination with any organization. He expressed no remorse for the crime and made only a short final statement saying, "In trying to insinuate that someone else has instigated the assassination, one strays from the truth. The idea arose in our own minds and we ourselves executed it. We have loved the people. I have nothing to say in my defense." Princip was found guilty, and it was at this point that the question of his age became pivotal to the outcome of his trial. The prevailing law of the country prevented the execution of any prisoner who was under twenty on the day of his crime. Princip's exact birth date could not be determined, and the court gave him the benefit of the doubt. He was sentenced to twenty years in prison, the maximum the courts could give. Princip was imprisoned in Theresienstadt prison in Austria. It is thought that he was tubercular before entering prison, and as a result of his poor health he underwent the amputation of an arm. During his incarceration he was transferred between his prison cell, where he was kept in solitary confinement, and the prison hospital where he was treated for his tuberculosis. Princip's death certificate reads that he died April 28, 1918 at 6:30 p.m. of tuberculosis of the bone in Theresienstadt Hospital. He was buried secretly. View the full website biography of Gavrilo Princip.